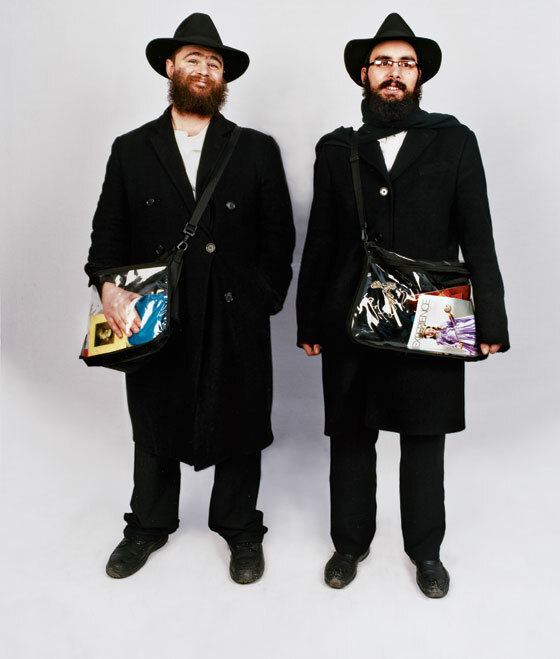 BEN TZION TODRIN: We’re looking for Jewish people, doing mivtzoim. It’s translated as “outreach.” We ask men to put on tefillin or do another mitzvah, tzedakah. The women we give Shabbes candles. How do you know if someone’s Jewish? BTT: Most of the time I just ask everybody. ’Cause you never know. I mean, I’ve asked black people before, and they’ve been Jewish. I ask Asian people. I ask everybody. SAGI CHEKROUN: I’m looking right now, so hopefully soon. It’s a lot easier than in the secular world. We have matchmakers, and before you go on a date, they interview you and see what kind of person you are and what kind of person that other person is. The guy asks the girl to marry him if all goes well. But there’s no kissing, right? SC: There’s no physical contact whatsoever until you’re married. Is the economy affecting your community? SC: Absolutely. People who usually give money to charity, to the organization—they don’t give as much. But we believe that God provides what we need, so we carry on with our work and try not to worry about it.